Moto Morini was founded by Alfonso Morini in Bologna, in 1937. Earlier, Morini had also manufactured motorcycles together with Mario Mazzetti under the name MM. Moto Morini is an Italian motorcycle company founded by Alfonso Morini in 1937 with headquarters in Trivolzio (PV). When war came he was forced to convert the factory to military-related products until 1943 when it was razed by bombs. As soon as hostilities ceased Alfonso Morini returned to motorcycle production, releasing his first post-war model, the T125, in 1946. Alfonso Morini was a former competition rider and a good designer, and realized that competition was a good tool to advertise his brand. His first title was gained in 1948 when Raffaele Alberti took the 125 Italian championship for Morini, with further success the following year with Umberto Masetti at the helm. In order to cope with demand a new factory was built at Via Bergami in Bologna, and further racing laurels accrued with the 1962 championship, this time with a rider who would soon become a household name and would go on to be ranked as the greatest rider of all time, Giacomo Agostini. When Alfonso Morini died in 1969 the reins of company were taken by his daughter Gabriella. Her tenure was beset by problems with unions in the latter years, beginning in 1983 with strikes which added to the already difficult financial situation. In 1987 she sold the company to the Castiglioni brothers, owners of Ducati. Gabriella Morini had hoped to see the marque revived by Castiglioni, using the new Lambertini-designed 60-degree V-Twin, but despite their initial enthusiasm for the project the Castiglioni brothers changed their minds, saying they already had a good twin in the Pantah. A half-hearted attempt to market a new Morini 350 Dart took place in 1987. This machine was basically a Morini 3 1/2 engine in a Cagiva chassis and was not well received. Morini production ceased in 1993. Morini came under Cagiva control in 1987, then in 1996 was purchased by the Texas Pacific Group which also controlled Ducati, and in April 1999 the rights to the name were purchased by Morini Franco Motori spa, a company founded by Alfonso Morini's nephew in 1954. After building large v-twin motorcycles early in the 21st century the company went into liquidation in late 2010. Moto Morini resumed production of motorcycles in 2012. The Moto Morini T, previously the Turismo, rolled out of the factory in the summer of 1946, the first motorcycle produced by the Bologna company. The two-stroke engine delivers 4.5 horsepower at 4.500 rpm via a three-speed gearbox. With various updates, including the adoption of telescopic forks and rear shock absorbers, it remained in the catalogue until 1955. The example in the Collezione Migliazzi is a Series II produced during the 1947-48 period and differs from the Series I in the design of the exhaust and the front guard stays, this one having two rather than four. 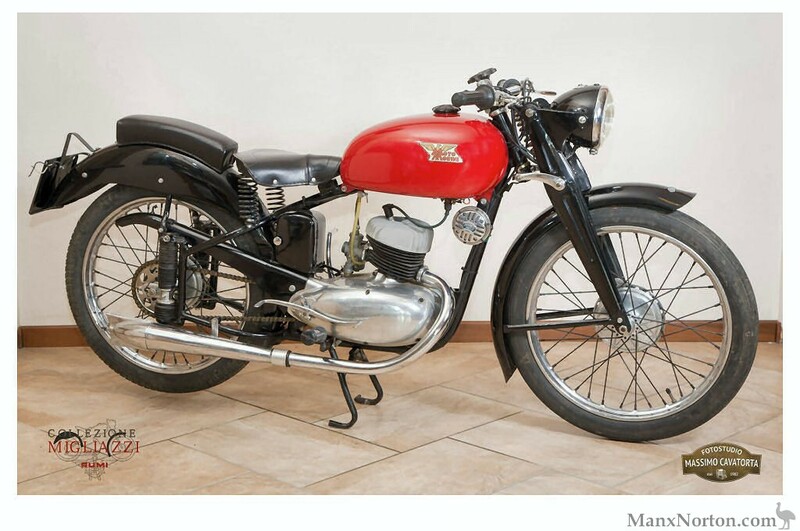 The Morini Super Sport first appeared in 1948. The 125cc engine develops 7.5 horsepower at 6.500 rpm and is reportedly capable of 100 miles per hour. In 1951, the last year of production, it was updated with new chassis, telescopic forks and swingarm rear suspension. In 1952 the Super Sport was no longer offered in the catalogue, leaving the Turismo and the Sport which now share many of the developments from their faster sibling. The example in the Migliazzi collection is from the first series. Colour: Black, with chrome tank, with black, white and green painted panels. Alfonso Morini was a former competition rider and a good designer, fully aware that competition success was an excellent advertisement for his brand. When Alfonso Morini died in 1969 the reins of company were taken by his daughter Gabriella. In 1987 the company was acquired by the Castiglioni brothers's company Cagiva, owners of Ducati. Gabriella Morini had hoped to see the marque revived by Castiglioni but production ceased in 1993. Cagiva was then sold to an American company, and the rights to the Morini name were purchased by Morini Franco Motori, a company founded by Alphonso Morini's nephew in 1954. Hello, I'm doing a resto' job on a 1962 Morini Corsaro in the U.K., and I'm stuck for final drive sprockets, front and rear, does anybody know where I might locate them . Its 13 tooth front, 42 rear, similar sizes would be ok. thanks. John.M. Buongiorno, ho aquistato una Morini Corsaro125 del 1960. Tellaio: E0956H AR55963. non piÃ¹ la chiave di accenzione; E possibile avere una coppia? Grazie. No, we don't have keys for 1960 Morinis, sorry. Photographs may help with model id. Ed. The photos are of my Step fathers Mini Bike purchased in 1968 in Riverside Ca. I had one identical as we bought 2 at the time Price was $300 at that time. Mine blew an engine and was scrapped, but I know the photo sent to me by a recent buyer in WI belonged to my Stepfather. How many were built with the 100cc engine and how many were inport to the USA? Hi I have 2 moto morini kj 125 and I would like to sale. How I can add on forum?? Would you please help me identify this motor? any information on motor and frame would be greatly appreciated! Can anyone help with some history and a book on the 50cc engine? Hi. I need some help with engine parts and other parts with my little"La Zanzara". Have you any idea on how to get parts for this bike? Where can I get parts for this motor? I have purchased a Morini 31/2 Sport which is a bit of a basketcase - am endevouring to restore it back to original. The front wheel currently has an Akront rim but I wish to relace with a Borrani rim. I am having difficulty in finding the proper front rim size. The rear rim is a Borrani WM3/2.15 18" x 36 spoke. Any idea what the front rim size should be for a Borrani? I borrowed and used a Bultaco Metrella flywheel puller to change the belt on my '80 3 1/2 sport. That was a while ago as I don't have the bike any longer. There may have been a few changes in flywheel/thread configurations over the years...those quirky Italians. One of the dumber things I did was to sell that bike. I am looking for any chassis, or motor parts for a 1967 Moto Morini 250 "Settebello." Any leads greatly appreciated. Attached is photo of 1967 Moto Morini 250 Settebello. This is the same motor that I have. I am searching for a flywheel puller so I can replace a broken belt. I was told that a Husqvarna puller would work, but no one could tell me which Husqvarna puller, as there are several models. Any assistance you can provide in locating a puller would be much appreciated. Size: 7-1/4" x 3-1/8" x 6-5/8"
12V 15AHAn Odyssey PC680 should fit very neatly. Unable to answer that at present. Perhaps try some of the sites listed in the Morini Directory at Bikelinks. Would like to purchase a oil pan plug but can not find one in USA. Looking for information or dealers that carry "valentini" mufflers and rear-sets for a 1976 Moto Morini Sport. I'm an italian owner of a 125 t (1951-2 or 53-54). i'm not a skilled technician but i'd like to restore it. i've read about Mr. Luzzi in Siena (Italy) but i don't know if he still works. Can anyone tell me if the factory is still going as I have had no luck by email or telephone. Please advise if you have a contact method .Thanks, Barry . I understand that Moto Morini is now run by Franco Motori. Try contacting them. Ed. The small family business of Moto Morini first produced single cylinder racers and went on to introduce bikes with a modern revolutionary V-twin from the drawing board of Lambertini. The bike has a quintessential Italian character without the flaws which slightly marred some other Italian bikes. With an advanced, but simple, engine it used top quality materials and the originality found in so many aspects of the design were world leading. This book contains road & comparison tests, model introductions, specifications, performance data, design analysis. Models covered include 31/2, Strada, Sport, K2, 500, Sport, Maestro, Sahara, Camel, SEI-V, Touring. Just a short note to let you know that John Hoffman is selling Cycle Specialty to Michael and moving to the Philippines. He will be gone in about a month. John is going to be a father and live in the Philippines with his new family. He will come back for two weeks each year. As part of selling off his business John has offered to sell me his Morini inventory. I have six typed pages of parts that unfortunately John did not save on the computer he typed it on. Each page has about 20 different types of parts on it and some have one but several have as many as five of each item. Gasket sets, master cylinder kits, valves, rings, foot peg and shifter rubbers, brake pedals, shift levers, and various other parts are there. There is a triple clamp, a 3 1/2 sport cam, and sport brakes upper and lower. I intend to try and scan the pages to see if I can send them on to anyone who might be interested. The list has a description as well as the Morini part number. I will keep some of these parts but will be willing to sell anything that I have a surplus of or do not feel I will ever need. I will also get two frames, one motor complete and together, and one motor taken apart. The latter is a 3 1/2 sport motor. We will all miss John as he is an Icon of Italian bike history and has been a font of knowledge. I will drive down to pick up the treasure trove in the next few weeks and anyone who would like to ride down with me to say good by to John is welcome to come. I think I would like to take him out to lunch. I went for a drive and had two 74 Moto Morinis followed me home in the back of my truck, being a sucker for red Italian sport bikes (O.K. the Sport was one time red and the Starda [Spada] is blue) I had to give them a home, they looked so lonely sitting there paint fading, spokes rusting. Anyone know a sourse for parts? I have heard they are not to hard to come buy and the Lemans lll could use a friend while the T-3 is being put back together. Hello, my name is Stefano. I want to tell you what I read few days ago on Il Sole 24 Ore, the Italian most important economic newspaper. Ducati sold the mark Moto Morini to Morini Franco Motori. When the actual American owners (Texas Pacific Group), bought Ducati from Castiglioni brothers (Cagiva Group), they bought Moto Morini, too. They don't consider Moto Morini a strategic business, that's why they decided to sell it. Have a look. It gets updated slowly, but updated. About the sale to Cagiva, I've heard that this was not the usual case of business failure. The Morini family was doing fine business, but they ran into some awful hassles with labor unions and got tired of it. The business was passed on to Gabriella Morini after the death of her father Alfonso. She kept the business going for several years, during which the V twin engine was developed as far as it could go without some serious input of money. The factory had spent a small fortune in developing the 500 Turbo which proved extremely fast and reliable but was too expensive to put into production. Towards the end the factory was mostly only producing "Custom" models, the New York and Excalibur. New laws in Italy meant that all riders had to wear crash helmets, this adversely affected the type of person the Customs were aimed at. To top it all the unions became very militant sometimes blockading the factory, causing the management to have to "sneak in" through the back entrance. The management had had enough, so that when Cagiva stepped in with an offer it was too good to refuse. The old firm had never gone into debt and with a new cash injection as promised by Cagiva they could have carried on. The chief engineer/designer, Lambertini, came up with a brand new 4 valve, water cooled, 67 degree, 750cc V twin. This was reported to produce more power and be lighter/cheaper than the Ducati engines. Cagiva did not want a rival to Ducati (who they also owned) and so they crushed any further development. That was a summary of some Italian articles I translated for "A Tutto Gas", the Morini Riders Club GB magazine.. I have attached a copy of an interview with Lambertini and Marchetti which you might want to use, very depressing conclusion. I was thinking of setting up my own web page with some of the pics and translations I have done, don't know when though. I will just add it to that ever increasing list of things to do. For the complete Interview click here! My pictures page now also includes a photo of Robert Haines Aermacchi 350 Sprint. Novembers Classic Bike (bought yesterday, read yesterday) has a nice V-Twin theme with a road impression of a Vincent, Ducati 900ss and Morini 3 1/2 Sport. Typically, the tester rambles on about the Vincent (first times he rides it, wonderful beast, etc...) and the Ducati (macho tool, animal on the street, etc...) and almost nothing on the Morini (testers own bike I think). A Morini an underrated bike? Indeed. They did have some Morini's on test in recent issues though. Good thing they are steering away from the only-Brit-bikes-are-classic-bikes idea. They even feature classic Japanese stuff now. As it should be. I'm wondering if anyone on the list has some clever ideas about reducing the grabbiness of the drum brake on the front of a Moto Morini Strada. It's about the only irritation to riding the bike. The front end can easily dive dramatically just as you're entering a curve, and it makes choosing and following a clean line a bit of a challenge. The otherwise excellent handling of the bike prevents this from being truly dangerous (so far). This has been noted on many of the original road tests of the bike, so it seems to be some aspect of the design and/or materials used. I took it apart once and fiddled about, trying to chamfer the leading edge of the shoes a bit, knocking off the glaze, trying to adjust the TLS linkage. It improved the braking a little but didn't seem to help much with the grabbiness. The Strada front brake was renowned for being as subtle as putting a stick through the spokes. In fact there was an attempt by the unfortunate rider of a Devimead test bike to claim that the brake was inherently unsafe when he binned one in 1975. I would have to agree that my first one did require careful use, but when I acquired the '76 bike I turned into a hill climb special the fork leg bore a sticker proclaiming that the brake had been prepared by a specialist in London (Ernie Hall I think). What ever he did, it made a fantastic difference. Now as it happens I am pretty sure I still have that 2LS hub (laced in to a Borrani valanced rim !) in the shed at the bottom of the garden. I could be persuaded to have a look inside for any obvious modifications , or even part with it. A conversion to disc is pretty simple if you can come by: A disc brake fork slider, wheel (disc brake wire wheel hubs are as rare as rocking horse manure), caliper and master cylinder. Mine was converted (using a cast wheel) with the aid of second hand parts from Benjy Straw's WeeVee back in '86 when I built the 'Rotarini'.